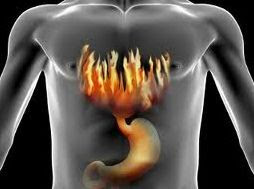 Heartburn is also called pyrosis or acid indigestion. According to experts, almost everyone experience heartburn. When you feel a burning and painful feeling in the throat or in your chest, there is a high chance that you're experiencing heartburn. Heartburn can be caused by a number of different factors, such as eating too much acidic and spicy foods, drinking too much coffee, and smoking. Determining the cause can be a good first step towards finding out how to cure heartburn. The issue at hand that becomes cause of heartburn is when it rises to your oesophagus (your tube that passes food to stomach from neck) there is not protection or stomach lining to prevent the burning from the acid. Heartburn itself is not so dangerous, it only cause some annoying and sometimes painful symptoms. However, if heartburn is left untreated, it could cause major problems. If you've ever flown a kite you quickly discovered how important balance is to keeping it pointed into the wind. The same is true for a heartburn cure. A heartburn cure will do its best when there is a direction based on a balanced meal plan. When it comes to curing heartburn naturally you have to pay attention to what you eat and how you eat it. You must not over eat and take your time while eating. You should chew your food completely and eat just enough to fill your hunger. One of the more popular home remedies applied to treat heartburn is a vinegar mixture. The most common is apple cider vinegar. You will find countless number of testimonials on line on how apple cider vinegar is an effective cure for heartburn. Unfortunately, there is no scientific proof that vinegar indeed cures heartburn. Another way of curing heartburn the natural way is by cutting down on acidic foods and drinks, like spicy and fatty foods, fried dishes, caffeine and chocolates. Making the right food choices is the most effective way to avoid the discomfort. One of the best ways to cure heartburn naturally is to use crystallized ginger or licorice tablets. You can take about two licorice tablets or a few pieces of crystallized ginger and chew them slowly to lessen the symptoms to get relief. the juice of the Aloe Vera plant is a very effective natural heartburn remedy. It gently soothes the irritated esophagus to get rid of the burning feeling. You must be very careful when using Aloe Vera. Keep in mind that you should not include aloin or the aloe-emoin compounds and other substances because these are powerful laxatives.Don't use the gel from the plant because it might be contaminated with latex. Smoking can cause heartburn. Because there is a muscle that separates your stomach from your gullet(oesophagus). When you smoke this muscle can be relaxed allowing passage of your stomach acid to your oesophagus. If you eat large meals. This can be another cause of heartburn. Your best bet would be to eat much smaller meals so your stomach will not become to full causing your blocking muscle to move out of place allowing acid to pass.